Firstly, thanks to everyone who gave their time to help out over the weekend. We hope that everyone felt that the exercise was worthwhile. Today, we had great weather and, apart from a light patch during the middle of the day, great sailing conditions. After a fairly slow start, it got fairly busy in the early afternoon. By mid afternoon there were 19 boats out on the water, which was a great sight. We had an additional 120 visitors; two more families joined and there seemed to be serious prospects for selling the Guides' Leader; one of the Picos and another Enterprise. 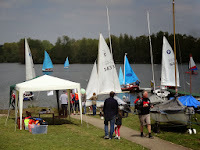 In total, we gave sailing tasters to over 80 people - and received £21 in donations! Time will tell how many of the visitors will convert to members but there seemed to be a very positive response and we are hopeful that several more families will join. A photographer from the Bury Free Press also came down today, so we are hopeful that there will be some good coverage of the event in the paper next week. More photographs have been uploaded to the Gallery.